Royal Burgess will face a side “looking for revenge” when the Barnton club bid to move a step closer to an eighth Clarity Edinburgh Summer League title triumph in nine years. Longniddry stand between Royal Burgess and a place in the final, the two clubs meeting at Craigielaw tomorrow a year after they locked horns in the last eight. 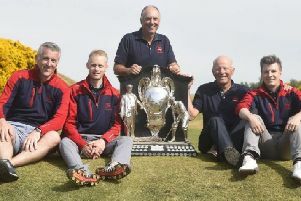 “We will be looking for revenge after losing last year on the strength of the first match going down the 19th hole to decide the tie,” said Longniddry team manager Alistair Robertson. As was the case last year, Royal Burgess won away in the quarter-finals, 5-4 at Ratho Park, to keep their title hopes alive. “While Longniddry obviously have a very strong team again this year, we have a strong belief that as we have done it before, we can do it again,” said Royal Burgess team manager Derek McGillivray. Tomorrow’s other semi-final sees Bruntsfield Links, the winners two years ago, take on Turnhouse, who have won every game so far this season as they bid to land the title for the first time, at Swanston New.